I wanted purple as the colour so i asked my mum and dad to get me purple paint for my room.They said no,i can’t have it I can have beige because they want it to match with everything and to look more posh.I also asked for a carpet n my room I wanted it blue and guess what?They said no i can’t have grey and i said but mum that’s the wrong colour I don’t want that colour!I want blue and purple as my room not grey! Today,I was in the park with my friends, when some one came and told me that they had been going behind my back and talking to them.I am so cross,they would never do that. I’m furious.I’m scared of what could happen in the future.And what my life will be like, a lie?A life any one had never heard of ?I don’t know,what is my life? The next day,I had told my teacher my troubles and worries. I don’t care what people think of me I can get people to like me,my own way;don’t mind me I’m just being me,people. There were screams of terror and people crying in fear. Alya soon discovered the boat was going down . Today,we are going live on Britain’s Got Talent,as an Acapella group! Later that day we hopped in the mini bus and drove to London. We were so embarrassed. We had practised for months-years actually,we were devastated all of that work for nothing! It happened again, this time it wasn’t Simon! This time it was Amanda! We went home and perfected and practiced . We went back in five years time, perfect! I woke up this morning , I needed a hair cut ! So i got up ,got dressed and jumped in the car and i drove to the hair dressers .I sat in the chair and waited for them to be finished but then i relised that i had eggs on my t-shirt! They were done finally and they had done my fringe wrong! she found part of a light bulb on the floor , she walked in the shed and thought it was very bare to her eyes it was pitch black, she remembered she hd the light bulb, so she took it out of her bag and found the cord and there ,finished. YES… I couldn’t believe it ,she even arrived at my door,with a hard knock. KNOCK KNOCK KNOCK. It was like everything to me it was Ariana Grande,the famous singer at my door! She litteraly arrived in a limo!The shock was high.We started with kareoke and a pint of lemonade.We stayed up until 9am. I gave her the spare room downstairs, she even put me in one of her music videos.I’m exhasted. I woke up with the noise of my phone beeping. It was from a tv company saying; turn the tv on and watch the first commercial! So I quickly rushed to my tv and pressed the on button and I could not believe my eyes… I was on the new iPhone Z commercial…It was amazing ! I looked on facebook and everyone had put brilliant comments about me , I was beginning to become famous,the commercial went viral in only 2 minutes flat ,shows how much they love the iPhones. Later that day I got a call from Ellen from the Ellen show saying she would love me to be on her show!! This is my chance to become a celeb! So I agreed to it ! I drove down to the studio right away! I went as one person and came out another! In a mysterious woods, lied a mysterious tree. That tree had all its leaves, but not all of its body.One day a biker came along and wasn’t looking ,without a dash…He crashed! 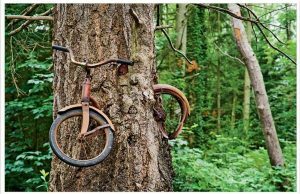 There were no chance of surviving that.A few years later the bike was wedged between the gnarled tree.The bike rusted from all the rain and the vines of the tree had grew over it.It was like it was eating it!The broken chain was hanging on the side of the tree,rotting. The more it rains, the more it rusts.Poor little fellow.